This ticket allows general access to four days of EXIT Festival 2019 from Thursday 4th - Sunday 7th July. This ticket allows general access to Day 1 of EXIT Festival 2019 on Thursday 4th July. This ticket allows Fan Pit access to Day 1 of EXIT Festival 2019 on Thursday 4th July. This ticket allows VIP access to four days of EXIT Festival 2019 from Thursday 4th - Sunday 7th July. This ticket allows VIP Gold access to Day 1 of EXIT Festival 2019 on Thursday 4th July. This ticket allows you access to camping only for EXIT Festival 2019 from Thursday 4th - Sunday 7th July. Please note you must have a valid weekend ticket in order to camp. 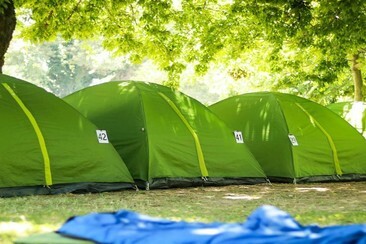 No need to carry your own tent to the festival - simply turn up and yours will be pitched for you in the EXIT Village! Please note that tent images are for illustration purposes only. 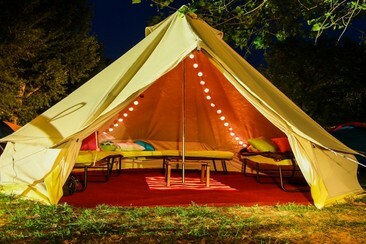 The tent you are allocated may look slightly different to this. Note: Kamper Planet is not liable or responsible for any damage, theft or loss of tents and equipment during their rental period. City Bech Hostel is maybe the most popular hostel among the visitors of the EXIT festival, and it’s because of its excellent location, and well furnished rooms. It is only a few minutes away from the Strand beach, where EXIT Village takes place, an oasis of greenery, parks, and restaurants. You can go for a short swim before you head for the Petrovaradin Fortress or simply chill during the day. You can catch a bus to the city centre (number 4), and a taxi to the Petrovaradin Fortress that costs around 3 euros. Each room has two single beds, an en-suite bathroom, and a kitchenette, and most of the rooms have a balcony. Bedding and towels are provided by the hostel, and you can place your valuables in a safe at the reception whose personnel is available 24 hours a day. There is also a shop in the hostel, so you’ve got practically everything you need for a perfect stay. Hostel City Center/Nikolajevska is located in the city centre of Novi Sad and just 10 minutes away from the Festival. It has a beautiful rustic look attracts many guests and students throughout the year. There is a lounge with TV, library, internet access, gym, two public phones and cafeteria which can serve up to 80 guests at the same time. During the day, guests can relax in the beautiful garden where to enjoy the tunes of special EXIT chill out DJ. 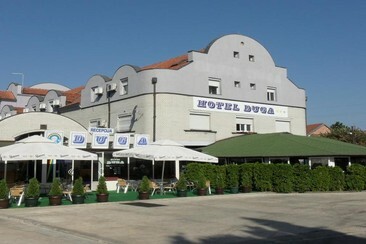 Hotel Duga is located in Novi Sad, administrative and cultural center of Vojvodina and one of the prettiest towns in Serbia. The hotel is located in city part called Telep and it is close to the Danube. Hotel Duga has 220 beds (single - double bed, double, triple and royal apartments). It offers free Wi-Fi and most of the rooms are air-conditioned. Set 5 km from Exit Festival, Sheraton Novi Sad offers 4-star accommodation in Novi Sad and features a fitness centre. 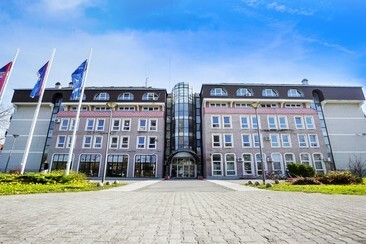 This 4-star hotel offers a spa experience, with its spa centre and hot tub. The hotel has a restaurant, and Novi Sad Tourist Office is 3.4 km away. All rooms with wooden accents offer free Wi-Fi, flat-screen TVs, private bathrooms and minibars. Hotel's services are 24-hour front desk, hair salon, laundry facilities, luggage storage, and wedding service. Get to the festival in comfort and on time by bus! 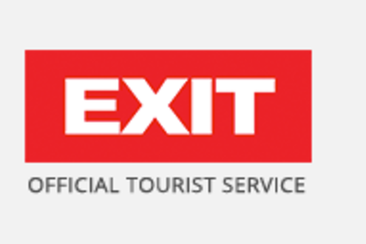 This service is provided by EXIT Trip. A one-way airport transfer from Belgrade Airport to Exit Festival venue. Get to the festival in comfort and on time by bus! This service is provided by EXIT Trip. A one-way airport transfer from Exit Festival to Belgrade Airport. Get to the festival in comfort and on time by bus! This service is provided by EXIT Trip. A one-way airport transfer from Budapest Airport to Exit Festival venue. Get to the festival in comfort and on time by bus! This service is provided by EXIT Trip. A one-way airport transfer from Exit Festival to Budapest Airport. A small locker to store your belongings in. Lockers are located in either the main camping area or the main foodland area of the festival. 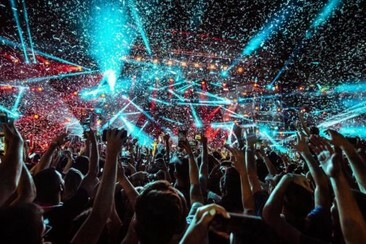 This tour offers an innovative music and tour experience, taking in the cultural sights of the Balkans as well as the underground music scene, all leading up to the pinnacle festival of the year in Novi Sad. 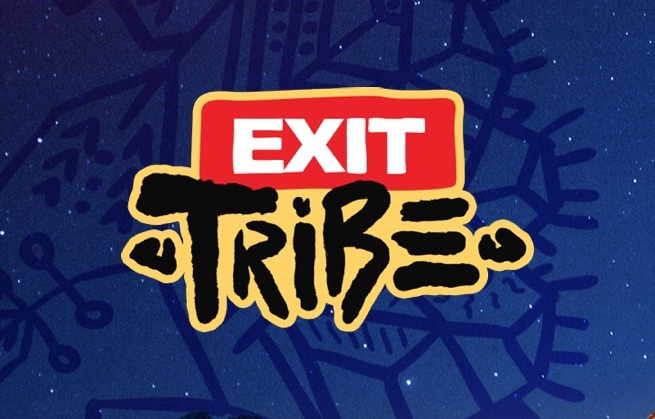 EXIT is not just about being able to do as you please, it’s the ability to open yourself up to new experiences, new cultures, sounds, tastes and friendships. On this experience we take you on a journey through the underground music scene in Belgrade, the beauty and serenity of Budapest, and the culture and thriving nightlife of Novi Sad, not to mention EXIT festival itself!